Sand is impossible to hold together. Mould it to whatever shape you wish and it will soon crumble; scoop it up in your hands and it will gradually slip through your fingers. Eirini Apostolatu’s performance of Phaedra is built on sand that along with the bone dry, sun-dried branches becomes an extension of her self. Even her costume of a boned bodice over a flowing muslin dress is sand coloured. She is mired in sand, burdened down with it on her entrance and even when she leaves the stage the sand sticks to her feet. Sand is a glorious metaphor for her shifting state of mind, a state that is in the process of falling apart, collapsing, about to reduce into its tiniest components. The stage at the Cockpit Theatre is small, surrounded on three sides by seating and covered in patches of thick dry sand. 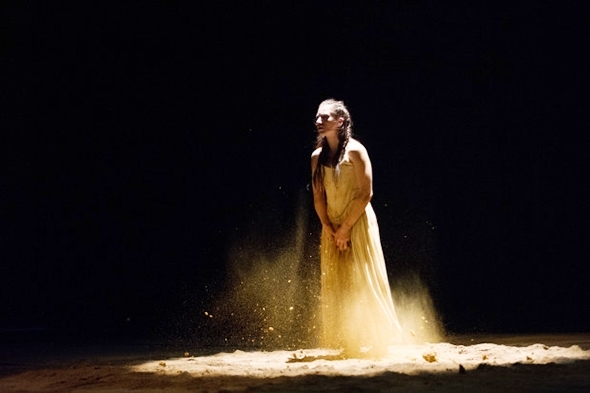 In the course of her 20-minutes solo Apostolatou becomes the very sand in which she moves, rising, falling, rolling and slithering with the quality of dry water. Sand muffles sound, too, so Apostolatou’s movements are eerily silent; the only sound comes from the pre-recorded sound of waves (a metaphor of washing or cleansing) mixed with narrated extracts from the ancient Greek play, Hippolitus, by Euripides. This is where the creative elements begin to come unstuck. Whereas the physical qualities of Apostolatou’s performance are very real (her ability to throw herself into the air, land like a rag doll and resolve the movement seamlessly to the upright again is worth the price of the ticket), the context is almost apocryphal: there is very little in what Apostolatou does to link her inescapably to the story of Phaedra or the story of Phaedra to her. What we see is a woman whose physical contortions — her gestures and postures of despair and regret — reflect an anguished state of mind but they exist as if in a vacuum. There is no history, except what is written in the program notes: we meet Apostolatou at some point on her journey as she staggers in bent under the weight of her burden but we do not know where she has come from. When she leaves the stage she is calmer and more upright than at the beginning as if she has exorcised her demons in the dance and come to terms with her fate but we don’t know where she is going. The performance is thus more like an abstraction of grief and despair rather than a narrative portrayal of an epic character. Perhaps this is what the program notes mean by calling the work a deconstruction of the story of Phaedra (the program notes are not otherwise particularly coherent) but then the work could be titled simply Grief and the context of Euripides would slide through Apostolatou’s fingers as quickly as the sand. This instability between concept and performance may indicate a divergence between Apostolatou, who is credited with choreography and Christiana Ioannou who conceived and directed the work. Whatever the reason, there is a sense of temporal inertia in the work; it seems to have no beginning or end (the end is so attenuated as to delay any audience reaction because we are unsure it has happened). Another element that reinforces this weak sense of time passing is that despite changes in physical dynamic, Apostolatou’s features barely register the changes. I don’t feel her mind is going on the same journey as her body and it leaves a dramatic gap in expression between the physical and the emotional; real time passes but psychological time barely moves. It is a shame as Apostolatou clearly has the capacity and the intensity but she needs direction that will channel these qualities inside a well-conceived framework.